Cervical pain, or neck pain, is the most obvious cervical symptom, but neck problems also cause headaches, arm symptoms and even difficulty walking. Often, the most common symptom that a person experiences that they seek treatment for is neck pain. The pain may be on one side or the other or all the way across the neck. A patient may have dealt with episodic neck pain that resolved over time and now the severity of the neck pain is no longer tolerable so they seek medical treatment. Neck pain without a identifiable injury is straightforward in that it is caused by inflammation from neck muscle strain or arthritis by way of chronic overuse. What is less straightforward are symptoms that radiate from the neck such as headaches, arm pain, shoulder blade pain and even ear pain to name a few referred cervical spine symptoms. It happens quite frequently that a person delays treatment for their neck because they don’t realize the symptoms they experience come from the neck itself. “But I have shoulder pain.” “My pain is in between my shoulder blades.” “My back of my arm is tingling and numb.” or “If I could just get rid of these headaches.” These are very common statements uttered by people with underlying neck problems. Another common presentation for people with cervical spine problems is they cannot recount a specific event or injury to their neck, so they are confused or frustrated when neck problems emerge and persist. “I didn’t play contact sports.” “I have never been in a car accident.” and “These symptoms just came out of nowhere.” These are very common statements made from patients who have neck problems. Certainly, a car accident or a history of contact sports can cause or lead to neck pain. More commonly, there are certain jobs that can leave a person at risk for neck muscle fatigue and overuse over time of the cushions in between the neck bones (cervical discs). Surely, a current football player can be at increased risk for neck injury or future arthritis, but occupations such as administrative assistants, hairdressers and painters can be jobs that set up the neck for problems over time. Any job where a person undertakes prolonged fixed positions with their head and neck can encounter cervical spine issues over time. Hairdressers look down much of the day whereas painters look up frequently. Any job answering the phone frequently leads to leaning one’s head sideways. Staring at a computer much of the day causes the neck to lean forward and stresses the muscles of the shoulders and cervical spine. When we think of working out and getting into shape, we think of almost every body part besides the cervical spine. Whether a person is focused on improving their endurance or firming up their mid section, the neck doesn’t make the cut for the exercise routine. But the neck needs maintenance just like other parts of the body. The muscles of the neck have to hold up our heads all day, which on average is about 10 or 11 pounds. So the neck muscles are at risk of fatigue and over time this fatigue leads to increased stresses on the soft tissues of the neck. The major soft tissue is interest when it comes to neck problems are the cervical discs in between the bones of the neck (inter-vertebral discs). When we are young these discs are very spongy, pliable and well hydrated. They are tall and sit neatly in between the vertebrae of the neck. Over time these cervical discs dehydrate and stiffen up. They shrink down in height and bulge out from the neck vertebrae in all directions. Nearby cervical spinal nerves can become pinched and then numbness, pain and weakness can develop. Neck pain with or without headaches, shoulder/arm pain and weakness in the hand are common symptoms patients can experience once a spinal nerve gets compressed. So why do the cervical discs behave this way? Because they have a poor blood supply. When we think of bones, we think of hard structures that support the other parts of the body like scaffolding. But most bones in the body have a great blood supply and therefore supply lines in and out of the bones are like highways that are used for nutrition and healing . This is why when a healthy bone is broken, as long as it is aligned and held in place long enough, it will basically heal as good as new. Unfortunately, cervical spine discs do not behave the same way as the bones of the body do. Discs of the cervical spine do not have the same access to healing pathways that most bones do; in fact they rely on the bones above and below for nutrition through passive diffusion. So when the cervical discs get injured or overused, they tend to stay injured and degenerate. This is where someone might be performing a simple activity such as running, or painting a ceiling and then next day their neck will be stiff and maybe even painful. These symptoms may be completely normal and get better with rest and anti-inflammatory’s such as Aleve, Celebrex or Ibuprofen. If, however, these symptoms persist despite conservative treatments they may indicate a bigger underlying problem. Commonly, a patient may seek medical attention if their symptoms don’t get better after several days of taking it easy. They may also wake up after having several days of neck pain with pain now radiating down their arm or into their shoulder blades. What sometimes happens is these ordinary activities that never caused long term problems in the past push the cervical spine over a threshold and the inter-vertebral discs can dislocate (herniate). 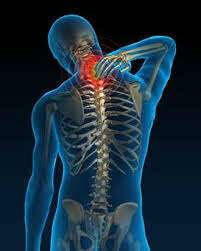 This creates a response from the body that results in significant inflammation in the cervical spine. The herniated cervical disc can also push abruptly on a nearby nerve and this is what causes radiating pain to other parts of the body. To make matters worse, the bones in the neck with their great blood supply will grow more bone over time in settings of inflammation and chronic overuse forming bone spurs in the cervical spine. These bony over-growths can become a big problem if they grow around or into a cervical spinal nerve or the spinal cord. So when neck pain emerges without injury the best thing to do is rest and take regular anti-inflammatory’s unless these types of medications cause bleeding or stomach upset. Some people cannot take anti-inflammatory’s because of blood disorders or history or stroke. Tylenol is also a good pain reliever that can help alleviate neck pain but must be used with caution or avoided if liver function is not normal. Formal physical therapy and chiropractic treatments can help resolving current symptoms as well as help to maintain long term cervical spine health. Physical therapy and chiropractic treatments are often second line efforts when rest and anti-inflammatory’s fail to resolve symptoms that are from the neck. If these treatment measures ultimately fail to resolve neck and/or referred pain then it is time to seek evaluation and treatment by a cervical spine surgeon.